Back Active Due To Buyers Financing STUNNING, NEWLY REMODELED END UNIT, TRULY MOVE IN READY. New Windows, Kitchen, Baths, Flooring, Lighting, Ceiling Fans and the list goes on. Off the entrance foyer you will find the oversized garage & also a bonus room w / french doors leading to a private fenced patio. Continue up to the 1st floor of living space to the kitchen with new Key West style cabinets, granite counters and S S appliances. French doors off the kitchen open to a private deck. Also on this level is a dining room and spacious living room with crown molding, fireplace and plenty of entertaining space. A new 2 piece bathroom is also located on this level. On the bedroom level you will notice the vaulted ceilings & skylight creating bright and airy space. The large master suite with walk in closet. All new bathroom also has french doors leading to a secluded deck. The 2nd bedroom also boasts a private deck with a 4th set of french doors. The guest 2nd bath has been totally remodeled with a step in shower . A full sized laundry room located on the bedroom level! Sunset Beach 3/10 mi walk. Stroll to restaurants, local brew pubs & shops. Public boat launch,fishing dock, tennis courts across st. Easy commute to Tampa Int'l Airport. 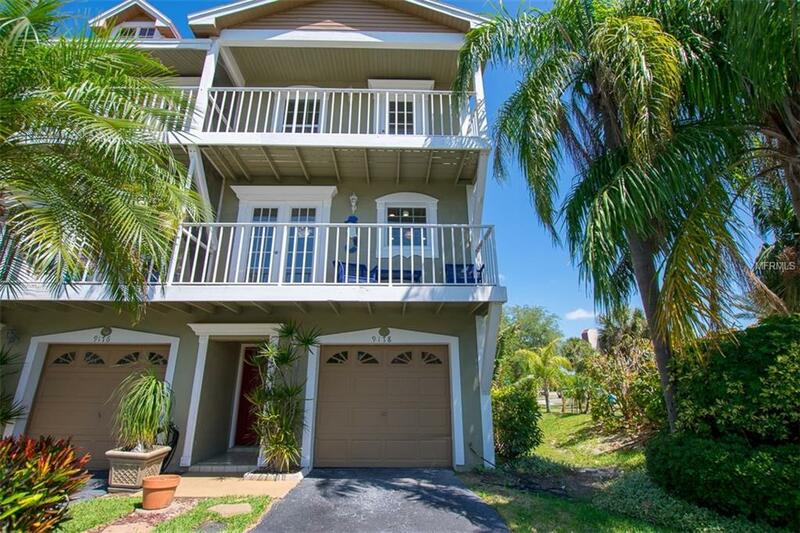 Rare to Market Townhome...A Definite Must See!